I ran over a squirrel today. Didn't even have time to swerve like on that car insurance commercial. He just tore across the street and then my tires bumped over him. And squished him. I really felt bad - and am still upset. 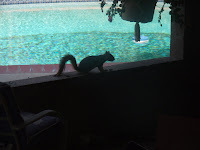 So upset that I could not scare off the squirrel that was nosing around our patio looking for birdseed cause the bird feeder was empty. 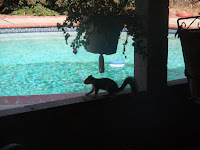 He was even going into this empty pot that the birdseed drops into - but was not comfortable enough to stay in there so I couldnt sneak out to get my camera in time to get his jack in the box act in that! i think the one I ran over was even larger than this guy....who doesnt know how lucky he is that the one dog who chases him isnt here this weekend! 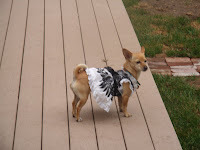 The other photo - Trixie is all dressed up for the baby shower last Sunday. Too bad she wasnt allowed in the house with the other ladies cause she was styling! I am being harrassed to go to the gym....see you all later! Oh no, it wasn't your fault. I do know entirely how you feel... hope things are better by now, especially with such a priceless dog to cheer you.